I hope you had a good solstice or mid-summers day. I have been flat out here creating, gardening, parenting. This week the energy building up to the solstice was oh so strong! it felt as though all the parts of my life were being expanded to the maximum. Sometimes I can feel over-wrought at this time of year, this year even with all it's calling and challenges I am managing to keep my feet on the ground. I have been following the drumming and journeying of Pixie Campbell, each day building up to the solstice with her 7 journeys. It has been a lovely calm way to end these days of intensity. So I have been totally immersed in nature, planting vegetables, walking in the woods and stretching there too! Many things this week reached the pinnacle of me needing to act. I am learning that when I can bring myself to ask for help, it's usually readily bountiful. There is so much wisdom out there. Many makings have been happening too. I down one set of tools and pick up another! Do you know the feeling?.......This is my summer time cushion. The reds, pinks and yellows of the summer especially have been calling me here. I love making these. I like the quick colour changes and the way it all comes together. 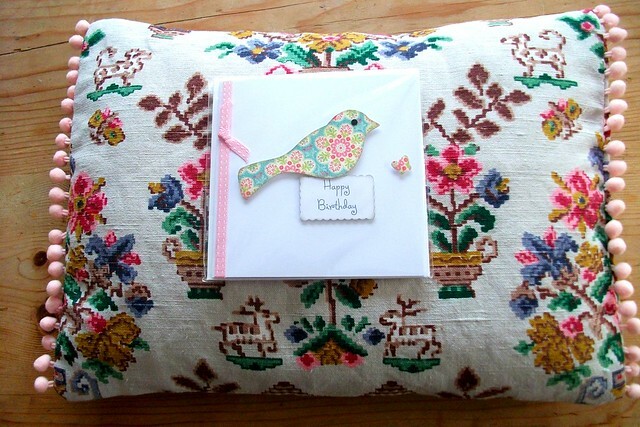 This together with this next cushion will be in my shop very soon. 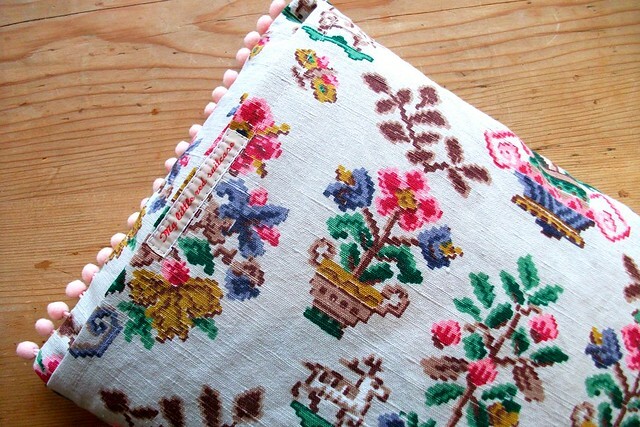 I began this cushion in the winter and choose this biscuit colour to edge it in. It seems to set off all the colour quite well. I just love some of these colour combinations. Love that blue and aqua, and the pink and yellow, it's always tempting to keep em'! 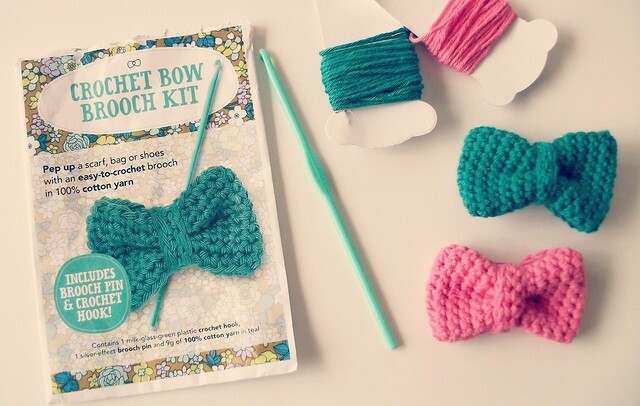 Can I show you my bows. One thing led to another as you can see! This is the free gift from mollie makes and I used some pink thread too. Aren't they sweet! So simple too. As I'm playing creative catch up I'll show you these, made during the last half-term holidays. This cushion became a birthday present. This was some very cute, folksy style material I found on my travels, edged with pompoms, which were a little tricky to sew but I love the finish. And here's the back! I'm enjoying using my labels. 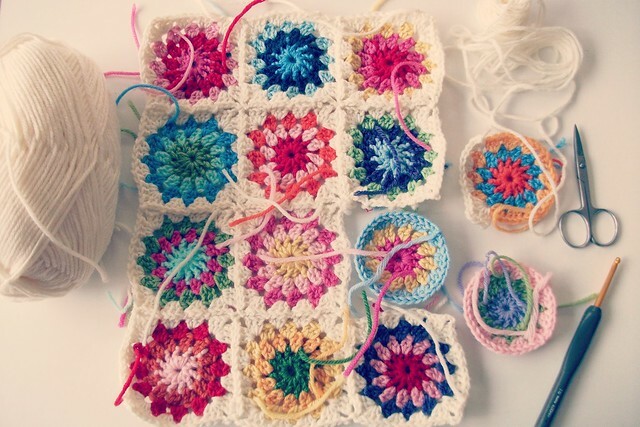 I don't sew them on my crochet cushions. I put them on my detachable labels instead. This ones sitting on my couch! It's made from some vintage Sanderson fabric I found. I had fun decorating the top with doilies and pearl buttons. It was very theraputic, although it's all a bit haphazard! Here's the back. 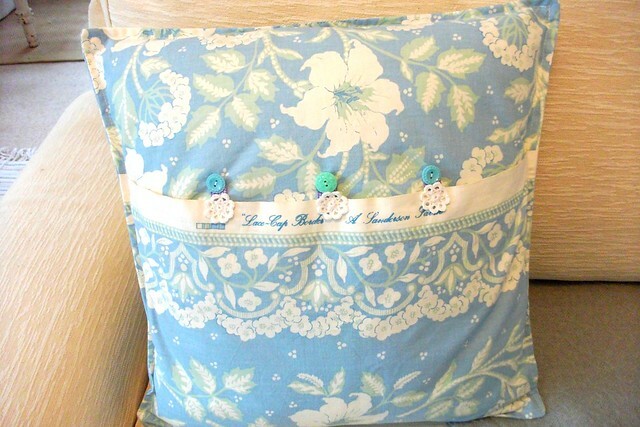 I thought the edge of the fabric was too nice to cover up so I kept it as part of the cushion and added some vintage buttons and little loops. I seem to make a lot of cushions. I am a great believer in the power of the cushion to change our lives!! On my couch right now! And still adding to them. Good job it's a big couch! All the better for flopping on at the end of the day! it's join as you go. I think Lucy at attic 24 has a tutorial. I will find out the link and let you know. It is easy and I think quicker, but you have to decide the layout pretty much first of all. all your cushions make me happy, too!!!! Yes I agree, feeling a lot of cushion love here too. I wish I could sew!! These are beautiful Heather. Thanks for sharing them. Have a good weekend. Hi Heather. Happy first day of summer! We have added a greenhouse this spring and it will have tomato plants in it by the end of the day. Love to see all the creative results on your blog. I'm glad I'm not the only cushion addict out there!!!!!!!! Gorgeous makes! 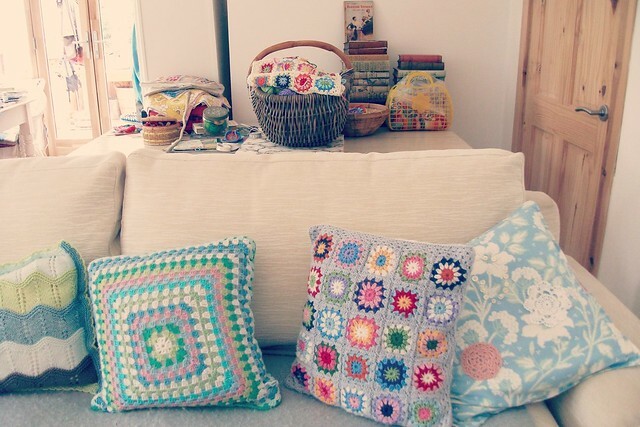 Love cushions, love crochet!! Your work and the pictures are very lovely. A yummie treat for the eyes! Hi Heather, I'm happy to hear that life is going well for you - can't beat being out and about in nature - except for being outside with crochet hook and colourful yarn, of course! Your cushions are all so beautiful - I understand how difficult it is to part with them but oh, the enjoyment of your lovely work being spread around is wonderful compensation, I'm sure. Do enjoy the remainder of your weekend. Hi Heather, Loads of good energy!!! 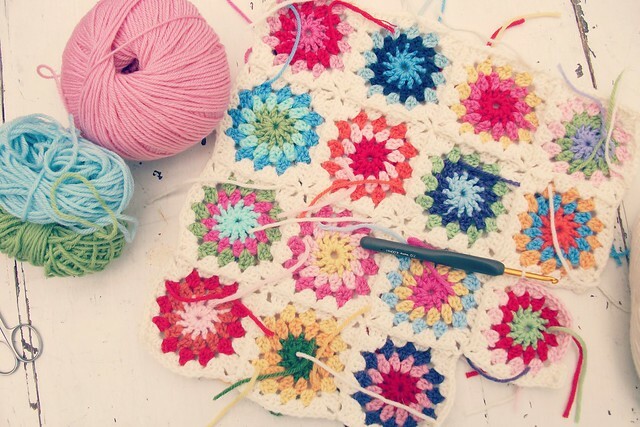 !Summer, nature and crafting usually does that!!! !I'm so happy I'm not the only cushion crazy one!!! !I really looooove them so much!!!!! Your 'makings' are all so lovely,I fully understand why you find it difficult to part with!!! 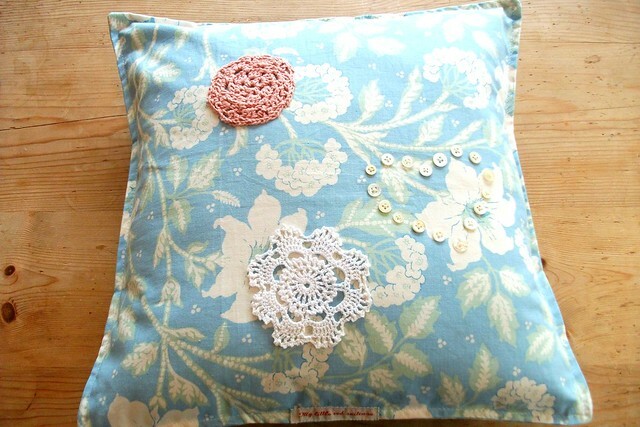 !Love your summer cushion!! !Happy colors = Happy Heather!! !Thank you for your very kind comments on my blog!!! Hope you'll have a fun filled and happy week ahead!!!! I love the Sanderson fabric cushion. The back is just as good, if not better than the front! Those cushions are gorgeous, and yes, I'm all for 'cushion power' too! The cushions are gorgeous! Great colours and they complement each other. I love the cushions. I have piles around the house to snuggle into and hug when I need to. 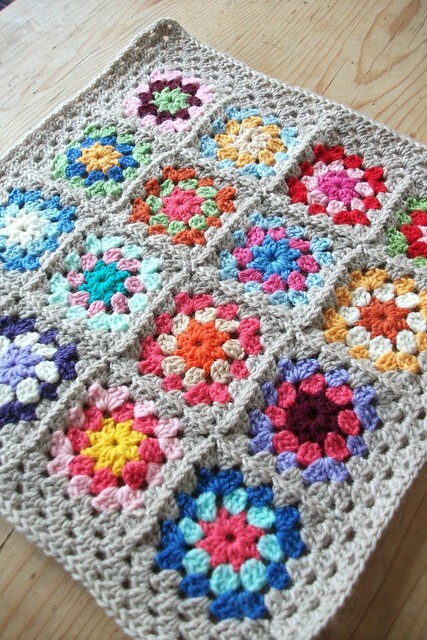 I must make my crochet cushion soon; just love the colour combinations!